Hear the tune via hennemusic here or stream it at Spotify.com. 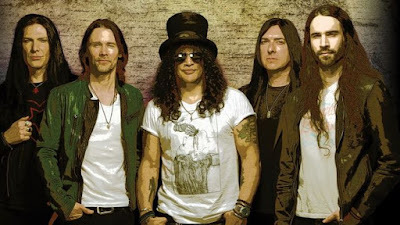 Slash worked on “Living The Dream” with producer Michael “Elvis” Baskette (Alter Bridge, Iggy Pop, Incubus); the set marks the follow-up to 2014’s “World On Fire”, which debuted and peaked at No. 10 on the US Billboard 200. Slash and the band will launch ”Living The Dream” with a month-long fall tour of North America that will begin at the Whisky A Go Go in Los Angeles on September 13. Currently on tour across Europe, Guns N’ Roses will wrap up the summer 2018 leg of their Not In This Lifetime in Iceland on July 24 before resuming the trek this fall.